This tutorial will be showing you how to install Nvidia graphics driver on Debian 9 Stretch. Debian by default uses the open source nouveau driver, which is included in the Linux kernel, for Nvidia cards. However, this driver lacks 3D acceleration support. If you are a gamer or need to work with 3D graphics, then you will benefit from the better performance of the proprietary Nvidia driver. Note: Before installing the proprietary driver, I recommend disabling secure boot if you are using UEFI firmware. The Nvidia module will be added into Linux kernel after you follow this tutorial, so the new kernel can not pass signature verification. If secure boot is enabled, your system could become unbootable. 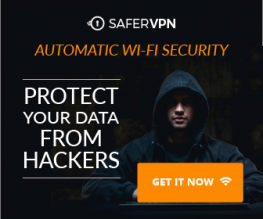 Some commands in this tutorial are prefixed with sudo. If your user account isn’t in the sudoer list, you can use the following command to switch to root user, assuming you know the root password. If you want to add the standard user account into sudoer list, run the following command as root. Replace username with your actual username. Log out and log back in for the change to take effect. From now on, the standard user can use sudo to manage the system. On my desktop computer, there’s no driver found, because my HDMI cable is connected to the Nvidia card, but the proprietary driver isn’t installed yet. Now install the nvidia-driver from the default repository. During the installation, you will see the following message, simply press Enter to continue. Then you need to install the driver from stretch-backports repository. First, add the repository with the following command. 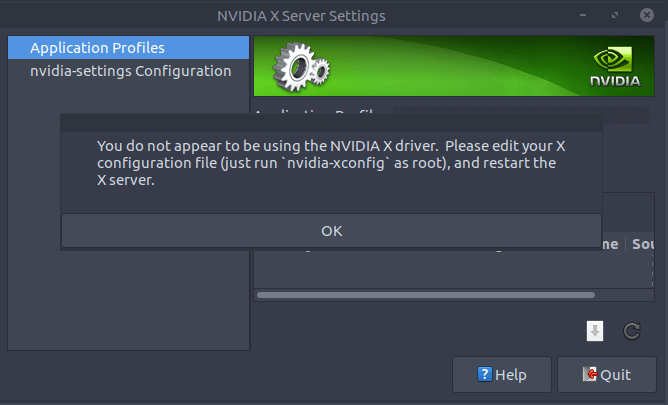 Note that you need contrib and non-free component to install Nvidia driver. If you have previously added the stretch-backports repository, make sure the two components are added. Now update software sources. Install nvidia-driver package from stretch-backports repository. Check which drivers is being used for your Nvidia card. As you can see, my computer is now using the proprietary Nvidia driver. Although the Nvidia driver is being used for Nvidia card, but your computer may still be using the integrated Intel graphic card. If you are using a desktop computer, you just need to shut down your computer, re-connect your HDMI cable to the Nvidia card, and start your computer. 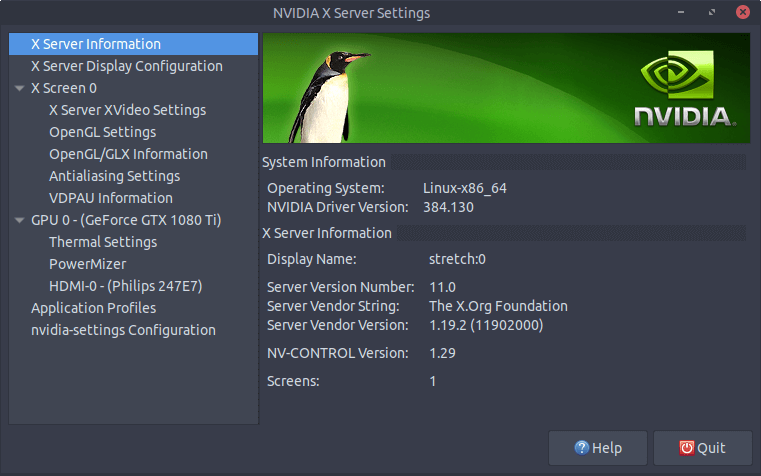 You can then start the Nvidia X Server Settings program from your application menu. You can check the driver version, graphics card specification, card temperature and so on. If you are using a laptop computer with Nvidia Optimus card and try starting the Nividia X Server Settings program, you will see the following error. My lightDM display manager won’t work after a reboot. Nvidia-xconfig is deprecated in Debian 9. It appears you can’t get the whole system to use Nvidia card, but you can use Bumblebee and Primus to run individual applications on Nvidia card. To run a program on Nividia card, simply prefix the command with primusrun. Thank you so much! One of the best instructions I ever read, very helpful!!! thanks sir…. I hope you get a great life….